One might assume that a fourteen fish day will prompt the author to rave about the wonders of early season fishing on the Big Thompson, but the reader would be quite mistaken. In short, Friday on the Big Thompson was an exercise in frustration. It was still a step above work, but my day of fishing was in some ways about work and persistence. Part of the disappointment may stem from the outstanding outing on Tuesday that will certainly rank among the top ten of 2012, so Friday on the Big Thompson was destined to suffer by comparison. But it was mostly the weather that conspired to make for a difficult experience. The string of five unseasonably warm days in Colorado in April ended on Wednesday and a front moved through the Rockies on Thursday evening resulting in cool seasonable weather. Clearly I was spoiled and for this reason the comparison to Tuesday was ill fated from a second perspective. 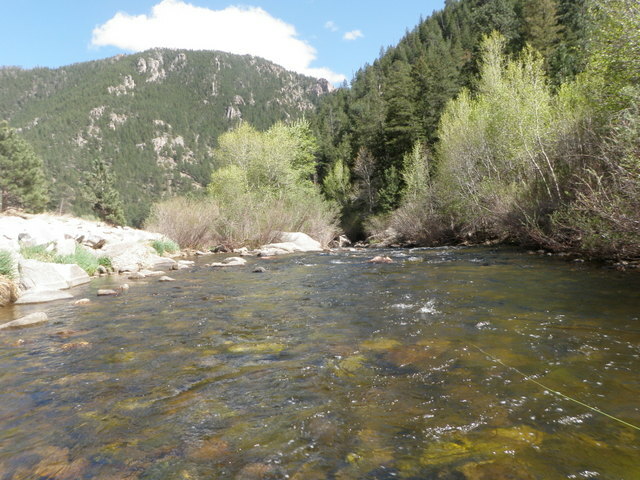 As I researched the options for my Friday fishing experience I checked out the South Platte River at Deckers, Clear Creek, the NF of the St. Vrain below Buttonrock Reservoir, and the Big Thompson below Lake Estes. The flows on Clear Creek were climbing to the 140 range so I guessed the early effects of snow melt were kicking in. The South Platte was at 119 cfs and this is quite low for this time of year. In retrospect this may have been a better option due to lower elevation and perhaps warmer temperatures. The St. Vrain flows were up a bit, but the DWR site does not provide a gauge below Buttonrock so it is difficult to assess whether the increase in flows initiate on the North Fork or South Fork. The Big Thompson flows were ratcheted down from +150 cfs to 51 cfs over the last couple days. These flows would be good for September, but very low for April. I was a bit concerned about the low flows, but decided to give it a try. The high temperatures were forecast to be low 60’s in Denver. It was the weather that I underestimated. Low 60’s in Denver translate to low 50’s in the mountains and that is exactly what I encountered. When I began fishing at 9:30AM on Friday the dashboard temperature reading was 48 degrees. When I departed at 3:30 in the afternoon the air temperature had increased to a balmy 52. But I haven’t even mentioned the factor that put the frustration in Friday. Wind. The wind bursts were intense and constantly rushed down the canyon in my face and against my attempts to cast. On numerous occasions I nearly lost my balance due to the intense force of the strong wind. When I began fishing in the morning I wore a warm Adidas pullover and a thick fleece, and I was chilled most of the time as the wind cut through my layers. After lunch at 1PM I actually added my raincoat as a third windbreaker layer and a ski hat instead of my wide brimmed hat and I was still chilly at times. I wore out my shoulder as I was forced to make five casts instead of one to hit my desired drift in nearly every location and the greatest frustration factor was tangles. I probably spent an hour of my total fishing time untangling snarls caused by the wind. The worst part was standing with my back to the wind trying to undo a massive monafilament mess while the wind howled and moved the line in every direction while I tried to make some sense out of the mess. The sound of wind rushing by my ears made me shriek numerous times out of frustration. Fortunately there were no other fishermen to hear me, and even if there were, they couldn’t hear me above the loud rush of the wind. 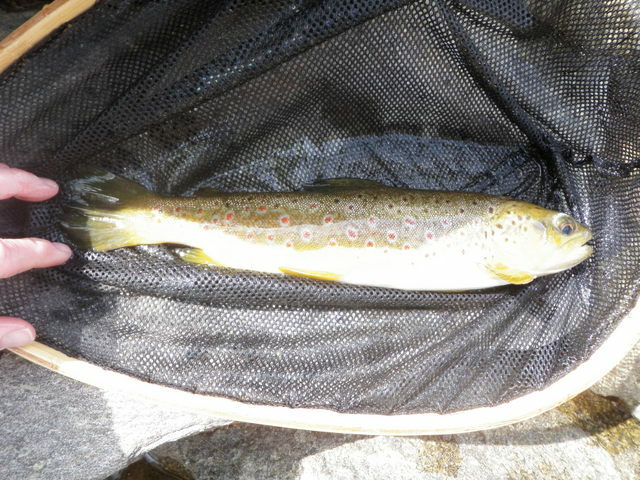 I landed fourteen trout mostly on the small side ranging from 6-9 inches with a few decent twelve inch fish in the mix. I probably caught an equal number of browns and rainbows, and that is unusual for the Big T where rainbows usually predominate. I landed four on a beadhead hares ear, five on a dark olive deer hair caddis with a palmered body, two on a tiny black midge larva, two on a beadhead RS2 and three on the muggly caddis. As you can see I was unable to get in any kind of groove from a fly selection perspective, and spent a lot of time reconfiguring. In several nice deep holes I sighted three or four fish hovering a foot or so below the surface but could not entice any takes despite changing flies and switching from dries to nymphs. In these cases, I could see that some of the larger fish were rainbows, and they were surprisingly selective, but to what I still don’t know. Between 11:30 and 1:00 I did hit on one fly that provided some level of consistent production, a small black midge larva with a fine silver rib and silver bead. I managed to land two small fish on this tiny imitation, but hooked at least five fish that felt larger and were rainbows that escaped the hook before I could bring to my net as the tiny hook makes it difficult to maintain a grip in the fish’s lip. Unfortunately I spotted some BWO’s on the water between noon and 12:30 and switched out the midge larva for a RS2. This was a case of overanalyzing as the fish didn’t respond to the RS2 anywhere close to the success of the midge larva. Saturday and Sunday weather forecasts call for similar weather to Friday, so I will have plenty of time to rest my shoulder and prepare for better days ahead. This entry was posted in Big Thompson River, Fishing Reports by wellerfish. Bookmark the permalink.